This is my favorite dry cured salami to make. It is far superior to the commercial dry cured salami you can buy. A lot of salami sold at the supermarket is cured in about a week. 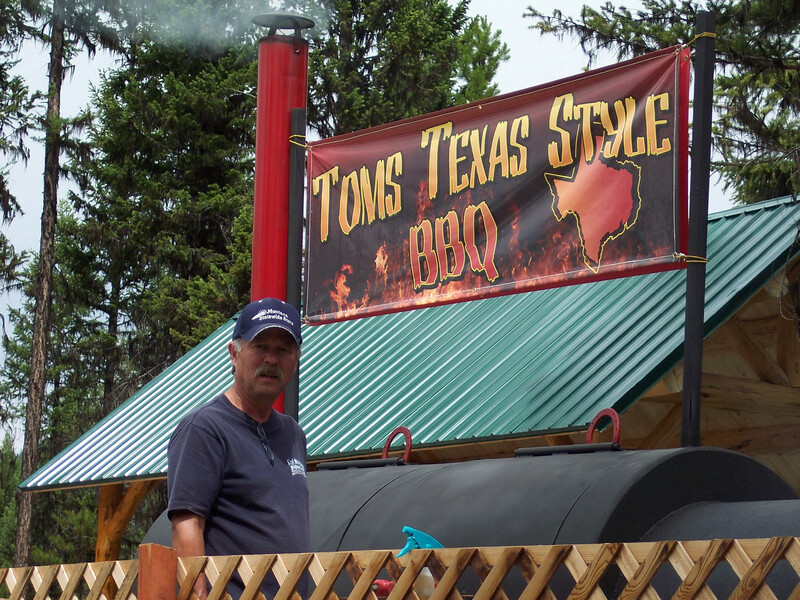 Commercial producers use a process called “fast-fermenting” by using a culture that reduces the moisture content and raises the acidity of the meat in a short period of time. This bypasses the aging process which adds a lot of flavor to the salami. I use a slow-fermenting culture, Bactoferm T-SPX, for traditional fermentation profiles. That means that good bacteria has time to work. Fast-fermented salami will always exhibit a tangy and sour flavor as flavor forming bacteria don’t have sufficient time to work with the meat. My salami can be eaten in 35 days which includes the first 3 days fermenting at near room temperature, however, the curing process continues as long as it is allowed to hang in the proper environment. The longer the better. There are some important guidelines that must be followed to insure a successful outcome when making a dry cured salami. Since it takes a lot of time before you can see the results of your efforts and hard work, you don’t want to come up to the day to take your first taste and find out your salami is spoiled or tainted with bad bacteria. My 6 rules are: 1.) KEEP IT COLD 2.) Use Instacure #2, not Mortons tender quick. 3.) Use slow-fermenting culture like Bactoferm T-SPX. 4.) Mix the ingredients thoroughly into the meat. 5.) Partially freeze the meat before grinding. 6.) Cure in the proper temperature & humidity ranges. If you follow these rules you should be very pleased with the finished product. Cut meat into cubes that will fit your grinder. Partially freeze the meat. Place your grinding tools such as the grinding blade, plate, auger, bowls in the freezer before grinding begins. Mix the Instacure and Bactoferm into the distilled water and let activate the culture for 30 minutes. Assemble the rest of the spices in a bowl and mix well. Assemble your grinder and grind the partially frozen cubes using a 3/8 grinding plate. Place the ground meat back in the freezer for 30 minutes. Remove meat from the freezer and mix in the spices and 1/4 cup distilled water containing the culture and Instacure #2. Be sure to mix thoroughly, about 6 minutes by hand, 3 minutes using a meat mixer. Place the mixed meat back in the freezer. If you have a meat stuffer, stuff meat into the protein lined casings in 5 equal amounts. If you are using your meat grinder as a stuffer, clean and sanitize the grinding unit and place back in the freezer for 10 minutes. Re-grind and stuff the meat in casings using the largest grinding plate you have as the whole peppercorns need to pass through the plate. Hang the five salamis in your curing chamber for 72 hours @ 68 degrees and a humidity of 85-90%. After 72 hours reduce the temperature in your curing chamber to 54-60 degrees and a humidity of 75%. Let cure in that environment for 32 days. The salami will lose about 30% of its volume during that time. You will see mold starting to grow on your casings in a week to ten days. This is good mold. If it bothers you, mix equal parts water to vinegar and wipe the mold off with a clean paper towel. I do it a couple of times during the curing process just to avoid the bigger job of cleaning it off at the end. I always take out one salami at the 35 day mark to sample. You can leave the remaining salamis in the curing chamber indefinitely. If you need room for more salamis to cure, you can store the cured salamis in the refrigerator in an unsealed ziplock bag. 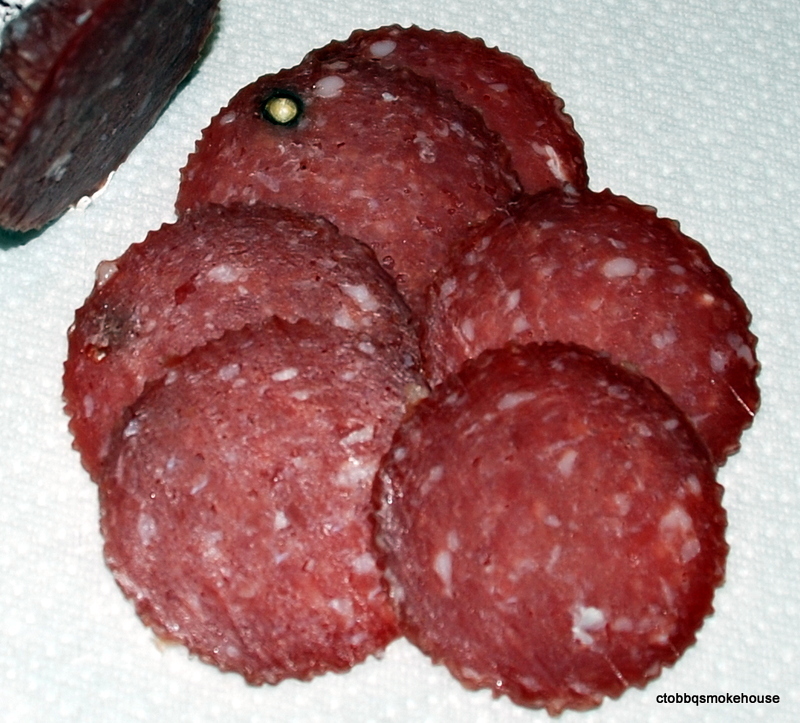 Be sure to never remove any of the casing from any part of the salami unless you are going to eat it right away. Salami with the casing removed dries out very quickly. 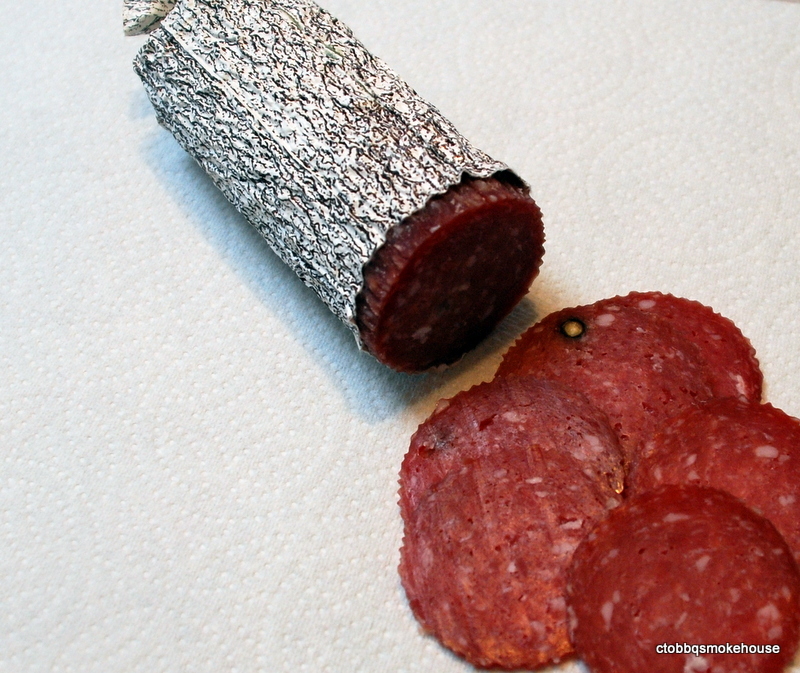 Partially open salami can be stored by putting plastic wrap over the cut end secured by a rubber band. This entry was posted in Dry Cured, Pork, Salami and tagged Italian.